Ethylene response factors (ERFs) are members of the APETALA2/ERF transcription factor family, and they play important roles in plant growth, development, and multiple environmental stress responses. In our present study, an ERF transcription factor gene designated as BoERF1 was isolated from broccoli, and its expression was induced by both NaCl and Sclerotinia sclerotiorum. Transgenic plants over-expressing BoERF1 were generated by Agrobacterium tumefaciens-mediated transformation, and they exhibited higher seed germination rates and less chlorophyll loss under salt stress as compared to wild-type (WT) broccoli plants, and an approximately two-fold increase in chlorophyll content was observed in three transgenic lines. Over-expression of BoERF1 in broccoli dramatically decreased hydrogen peroxide (H2O2), relative electrical conductivity (REC), and malondialdehyde (MDA) contents, but increased free proline, the activities of catalase (CAT), peroxidase (POD), and superoxide dismutase (SOD), resulting in less cell death in the leaves of transgenic plants. Moreover, broccoli plants over-expressing BoERF1 exhibited significant resistance to Sclerotinia stem rot as compared to the WT line. 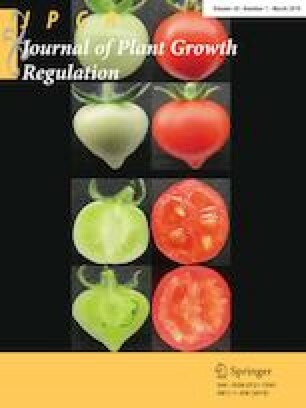 Qualitative real-time PCR (qRT-PCR) results confirmed that the expression levels of BoERF1 in transgenic lines were higher than those in WT plants, and the peak expression levels were seen at 24 and 12 h with 3.21- and 4.66-fold changes after treatments with S. sclerotiorum and NaCl, respectively. Taken together, our results indicate that BoERF1 acts as a positive regulator in resistance to both salt stress and Sclerotinia stem rot, suggesting its potential utility in molecular breeding of broccoli. This work was supported by Public Welfare Technology Research Projects of Zhejiang Province (2016C32091), Taizhou Science and Technology Project (162ny14), and Research Projects of Taizhou University (2017JQ001). Conceived and designed the experiments: MJ. Performed the experiments: MJ, HZ, and LM. Analyzed the data: ZY. Wrote the paper: MJ.